This week’s Mastercook challenge was all about keeping it monochrome. We want the contestants to create a dish based entirely around one colour. They could choose from white, yellow, green and red. You can see what they came up with here. I for myself chose green as my token colour. There are so many fabulous green vegetables and herbs that it was an obvious choice for me. I’ve come up with a creamy pea risotto, which I’ve flavoured with lots and lots of herbs. 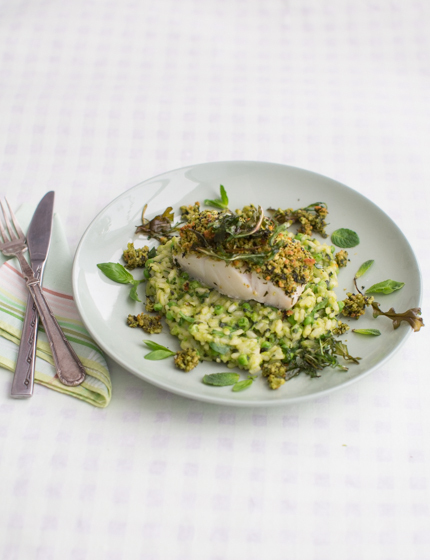 On top of it sits a lovely herb-crusted cod fillet, which adds texture to the whole dish. It may look like there are a lot of steps involved, but it’s actually quite straightforward. The perfect dish for a dinner party or Sunday lunch. 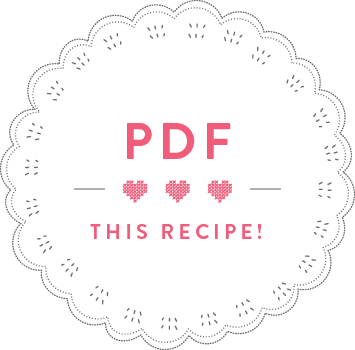 If you want the recipe in Luxembourgish, you can find it here. Start by cooking the peas in boiling, salted water for 2 minutes until soft. Drain and put half of the peas into a bowl and purée with a hand blender. Over to the herb crust: toast the bread slices until golden. Leave to cool, then tear into chunks and put into a blender. Peel and roughly chop the garlic clove and add to the blender with the lemon zest, mint, basil, olive oil, salt and some pepper. Blend until you get a wet, breadcrumb mix. Season the cod fillets on all sides with salt and pepper. Lay into an oiled oven tray and cover the top with the herb crumbs, pressing them down to form a crust. Shape the remaining herb crumbs into a small “biscuit” and lay it next to the fish in the tray. Refrigerate until needed. Preheat the oven to 200°C fan. Over to the risotto: Peel and finely chop the half onion, peel and finely chop the garlic clove. Heat the olive oil and 10g butter in a saucepan and fry the chopped onion and garlic clove in it for 3 minutes until the onion starts to soften. Add the risotto rice, stir well and fry for another minute, then add the wine and bring to the boil while stirring. Once the risotto rice has absorbed all the wine, gradually add the vegetable stock – always a ladle at a time, stirring between each addition and only adding more liquid once all the liquid has been absorbed. This will take approximately 20 minutes. Meanwhile, bake the fish in the preheated oven for 12 minutes. Pour enough olive oil into a frying pan, to cover the base. Heat the oil and fry two handfuls of rocket in the hot oil for 2 minutes until crisp (be careful as the oil will spit when you add the rocket). Drain the fried rocket on kitchen roll. Back to the risotto: roughly chop the mint, basil and rocket needed for the risotto. Once the risotto has absorbed all the stock, add the chopped herbs, the pea purée, peas, 10g butter and parmesan and fold into the risotto. Season with salt and pepper. 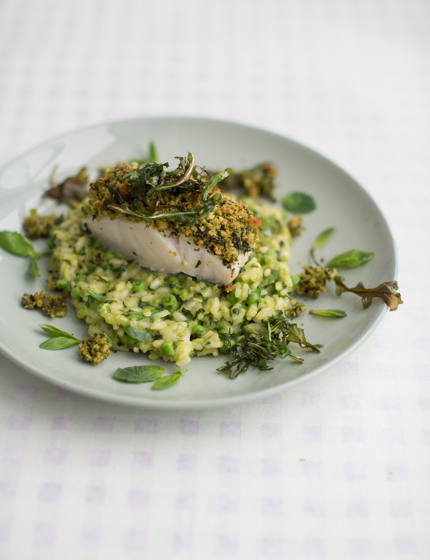 Distribute some risotto onto two plates, lay a baked cod fillet on top and top with a bit of fried rocket. Crumble the herb “biscuit” on the plate and decorate with fresh herbs.